In general, I prefer to use application time (time at the event publisher) versus the time the message was enqueued. If you don’t have that timestamp, enqueuedTime is the next best thing. How can we optimize the function even further? Read on about the cardinality setting! Clearly, the function uses the eventHubTrigger for an Event Hub called hub-pg. In connection, EH refers to an Application Setting which contains the connections string to the Event Hub. Yes, I excel at naming stuff! The Event Hub has defined a consumer group called pg that we are using in this function. The cardinality setting is currently set to “one”, which means that the function can only process one message at a time. As a best practice, you should use a cardinality of “many” in order to process batches of messages. A setting of “many” is the default. A great resource to get a feel for what these settings do is this article. It also comes with a Power BI report that allows you to set the parameters to see the results of load tests. In this post, we used the function.json cardinality setting of “many” to process a batch of messages per function call. By default, Azure Functions will use batches of 64 messages without prefetching. With the host.json settings of maxBatchSize and prefetchCount, that can be changed to better handle your scenario. In a previous post, I talked about saving time-series data to TimescaleDB, which is an extension on top of PostgreSQL. The post used an Azure Function with an Event Hub trigger to save the data in TimescaleDB with a regular INSERT INTO statement. The Function App used the Windows runtime which gave me networking errors (ECONNRESET) when connecting to PostgreSQL. I often encounter those issues with the Windows runtime. In general, for Node.js, I try to stick to the Linux runtime whenever possible. In this post, we will try the same code but with a Function App that uses the Linux runtime in a Consumption Plan. Now, in the Function App, set the following Application Settings. These settings will be used in the code we will deploy later. Saving the data to a relational database is often tempting. It fits in existing operational practices and it is easy to extract, transform and visualize the data. In practice, I often recommend against this approach except in the simplest of use cases. The reason is clear: these databases are not optimized for fast ingestion of time-series data. Instead, you should use a time-series database which is optimized for fast ingest and efficient processing of time-series data. The difference is clear. With a regular table, the insert rate is lowered dramatically when the amount of data becomes large. The TimescaleDB extension can easily be installed on Azure Database for PostgreSQL. Let’s see how that goes shall we? The server name you provide should result in a unique URL for your database (e.g. servername.postgres.database.azure.com). The above command partitions the data by time, using the values in the time column. By default, the time interval for partitioning is set to 7 days, starting from version 0.11.0 of TimescaleDB. You can override this by setting chunk_time_interval when creating the hypertable. You should make sure that the chunk belonging to the most recent interval can fit into memory. According to best practices, such a chunk should not use more than 25% of main memory. The example above is from an Azure Function we will look at in a moment. In extracts values from a message received via IoT Hub and inserts them into the hypertable via an INSERT INTO query. Let’s take a look at the Azure Function next. The image below shows the Azure Function (based on this although the article does not use a hypertable and stores the telemetry as JSON). Naturally, the Azure Function above requires an Azure Event Hubs trigger. In this case, event hub cardinality was set to One. More information here. Note that you should NOT use the NOW() function to set the time. It’s only used here for demo purposes. Instead, you should take the timestamp sent by the device or the time the data was queued at the Event Hub! The above query simply counts the messages in the last minute. Notice the flexibility in expressing the time which is what we want from time-series databases. When dealing with time-series data, it is often beneficial to use a time-series database. They are optimized to ingest time-series data at high speed and greater efficiency than general purpose SQL or NoSQL databases. The fact that TimescaleDB is built on PostgreSQL means that it can take advantage of the flexibility and stability of PostgreSQL. 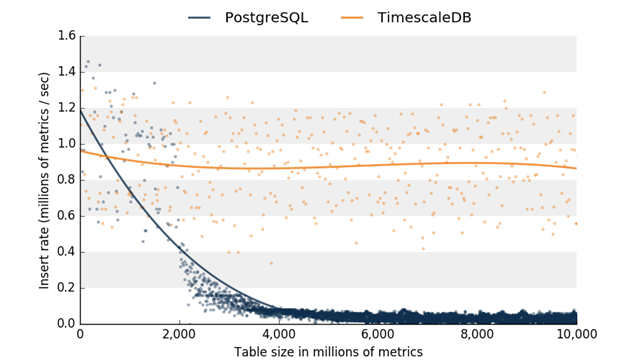 Although there are many other time-series databases, TimescaleDB is easy to use when coupled with PaaS (platform-as-a-service) PostgreSQL offerings such as Azure Database for PostgreSQL.